I wanted to make something for the blog, but not invest a lot of time in it this evening, so decided to try making cornstarch pudding. There are only six ingredients and not a large quantity, so if I messed it up, it wouldn’t be a great loss. This recipe only calls for 3 tbsp of sugar, so you know it’s not going to be very sweet. 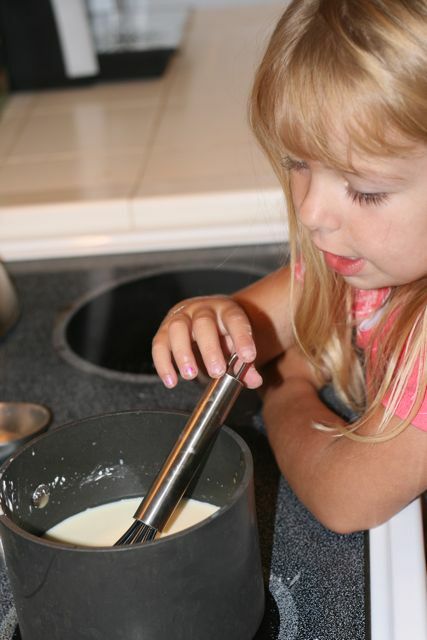 My assistant poured the sugar and cornstarch into the pan, then I poured in the milk. I mixed it carefully to be sure there were no clumps of cornstarch lurking at the bottom. I added 1/2 tsp of vanilla and a smidge of salt, maybe less than 1/2 tsp. One thing I did differently from the recipe is that I cooked the egg yolks in with the rest of the ingredients. The idea of just adding them at the end and not really cooking them is kind of gross to me. If you want to be a purist you can follow the recipe exactly. We carefully stirred the pudding over a medium heat. After about ten minutes I started to see that it was thickening, and I really watched closely. This was fascinating how it all just sort of happened at once. 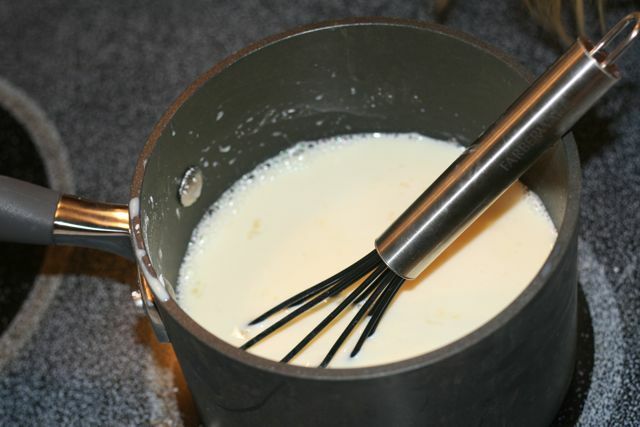 One moment the mixture was fairly thin and whiskable, the next moment it was beginning to clump and I removed it from the heat, I whisked it and then it was completely smooth. This all happened at about the 12 minute mark and took about five seconds. Like my neon green dish? The pudding came out a little thicker than an instant pudding, maybe because it cooked a little longer than it should have. We ate it slightly warm and it was a smooth, mellow treat. It’s not terribly sweet, keep in mind, so if you want it a bit sweeter, add another tablespoon of sugar. I added 1/2 tsp of vanilla, but it could have taken a full teaspoon. Geneva’s still pretty sick, but she ate some pea soup so I think we might make this today. Smooth and easy on the tummy. Angel pie was yummy, by the way. I hope she feels better soon! 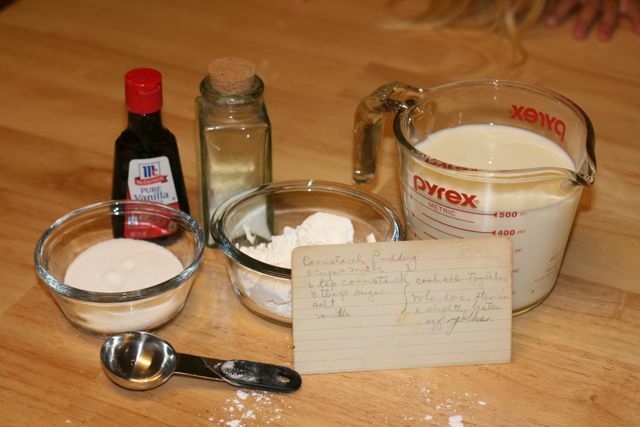 My sister used to makee pudding when I was really sick. This recipe is not very sweet FYI. The eggs will cook if u do as the recipe says to. It doesn’t take much to cook the eggs as the pudding is HOT. 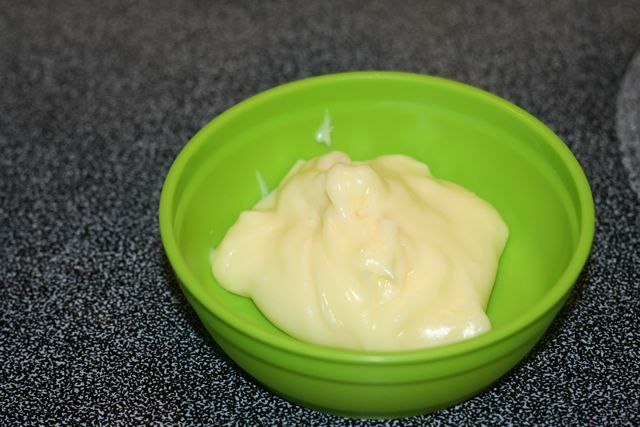 i love making cornstarch pudding..its so cheap and easy. i have 7 kids so i make it in a huge stainless steel pot, and it goes pretty far. i make mine with enough sugar to taste sweet and about a tablespoon of butter.